Our visit to Patten Pond with extended family is always a highlight of the summer. Tons of reading, swimming, relaxing, and eating (mostly lobsters!). This year, I've also managed together some very nice rides in! Here's the lowdown. Here's a nice 30ish-miler around Acadia's lesser-known Schoodic Peninsula. No Thunder Hole or tea and popovers here, just beautiful views, tidepools, and smooth, quiet roads. I only experienced limited views because the a thick fog had descended on the area when I did the ride, lifting only as I was finishing up. Still, a great ride, and can't wait to do it under better conditions! The road around the park is straightforward enough. But I followed the loop that begins on West Gouldsboro documented by the Maine DOT at http://www.exploremaine.org/bike/schoodic.html . There are lots of good tours documented there, though not as many as you'd expect. Here's a ride that I haven't quite done all of, but seems to have great potential. Newbury Neck is another peninsula that extends down between Morgan Bay and Union River Bay. If you start in Surry at the intersection of 172 & 176, follow Newbury Neck Rd south, avoiding the main signposted routes to Blue Hill etc. the road goes all the way to the end of the peninsula with rolling hills and very little traffic. Views are mostly limited to trees and the odd glimpse of water, since almost all the roads leading to the shore are private - but the real selling point for this out-and-backer is the opportunity to put your head down and just go. This us one LOVELY out-and-back. Like ride mo 2 above, this might not be worth travelling from a distance to do (really because it starts at Route 1, which is just about as inhospitable a road as I'd ever care to bike on). But this turned out to be a great ride for mr because it starts practically across the street from our cabin. There are two big things to note about this ride. There us no Happytown per se, as far as I know anyway. So don't turn down Happytown Road expecting it to lead you there. The other thing is that this 24-mile ride is about half unpaved hardpack gravel with some washboardy bits. Absolutely perfect for me and Thorny, but anyone on a carbon fiber trifle might run into trouble. So, as long as you aren't expecting to arrive in Stepford or Shangri-la-di-da Valley, and you've got a sturdy ride with fatties fitted, then this a nice ride for you! The way I did it today, it's about 12 miles out and 12 back. I rode out Happytown Road from Rt 1 until I got to the crossroads with Winkumpaugh Rd and turned right, following the sign to Annie's Pride general store (isn't that a great name, though? Who wouldn't take that turn?) the store is just across another main road - Rt 1A. I didn't go in, but know it's got a good rep. There seem to be lots of alternatives, including continuing on Happytown Rd (maybe there is a Happytown at the end of it somewhere?) - I chose this route because I was intrigued by Annie and it fit the time I had for riding today precisely. The route is gorgeous, with sweet little farms, woods, and great huge fields with typical Maine blueberry bushes and boulders, and a couple very old cemetaries. Another highlight along the route for another time is the New England Telephone Museum. It's also probably worth mentioning that it's pretty hilly, but nothing too ridiculous. By next year, both of our girls should be able to pedal these with aplomb. I also want to ride Park Loop Road to the top of Cadillac Mountain. Already partially complete, this is another rails-to-trails project employing crushed gravel surfaces and catering to ATVs in addition to walkers and cyclists (seems that's how it works round these parts...). See http://www.hcpcme.org/transportation/sunrise . I love rail-trails. 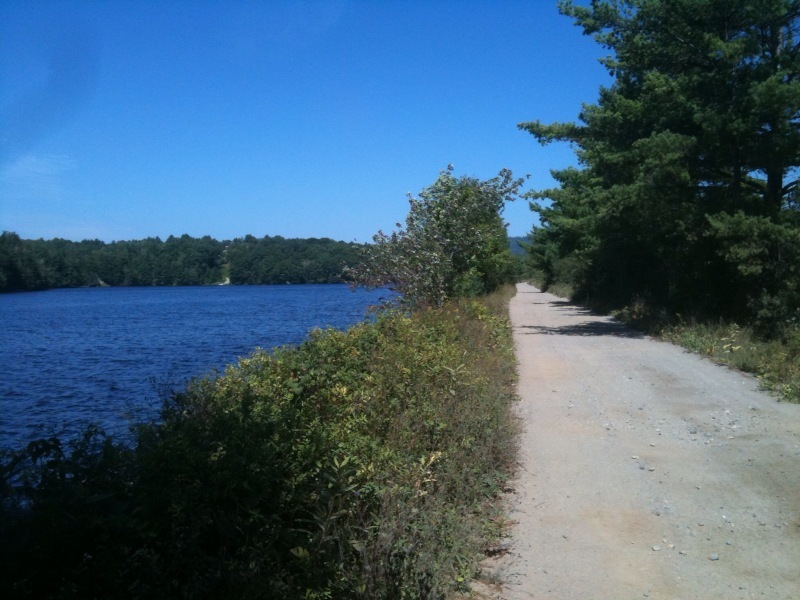 So when figured out that there's a 16-mile trail near where I'm staying with family in Maine, I decided to forgo my plan to do a 40-mile route and ride the Kennebec Valley Trail from North Anson to Bingham and back. There wasn't much information out there, though, which was surprising. So in the end, I went to Google Maps and looked up bike routes between Madison and Bingham, and it seemed to indicate that the rail trail started around the North Anson Cemetery so that's where I went. It was already a reasonable distance from Skowhegan, so I decided to drive to the start and bike from there (that irks me - it seems a bit of a cop out!). I found the trail with no trouble, but it wasn't actually clear that it was the start at that point. It seemed as good a point to start as any, though. There wasn't any parking so I parked around the corner at the North Anson Community School, though that might not have been an option if it wasn't a Sunday. I knew it wasn't a typical rail trail from the get-go: the surface was variable, with gravel, sand, rocks, and washboard sections. I'm accustomed to hard-packed fine gravel, but this was a bit of a challenge. I really wouldn't recommend it for people with road bikes, and even mountain bikers should be sure to have good treads on their tires. I was riding my Thorn with 1.75-inch tires pumped up far too hard - but I preferred less traction to a puncture. Turns out that the primary users of the trail aren't bikers or walkers at all - they're ATVs in the summer and snowmobiles in the winter. I came across a half dozen or so ATV riders today, and they were all pleasant enough (except one, who was going too fast and didn't give me much space). And for their use, I'm sure the trail would be perfectly fine. But I didn't see any other cyclists today. The first half of the trail was pleasant (apart from the surface), but a bit monotonous: woods and the odd bit of cornfields. At about halfway, I reached Solon and the big dam and bridge. It was a nice oasis there - a beautiful open space with views up up and down the Kennebec and even a picnic table. After that bridge, the path is more scenic, running right along the river. But with the views come more ATVs, and the road surface didn't really improve. Finally, I reached the unceremonious end of the trail at a motel in Bingham - and popped out on busy 50+ mph Route 201. I asked in a little grocery store how to get back to North Anson and it turned out that all I had to do was cross a nearby bridge and head down Route 16 (201A). That was really nice - a wide, newly-paved road with some nice rolling hills. The only catch was that the road was officially closed just before North Anson, but since the road works weren't active on a Sunday, I was able to walk my bike the 100 feet through the mounds of dirt and diggers. And in a few minutes, I was back at the car and headed back. So at the end of the day, I probably wouldn't do the trail again without different tires and even then, there are much more interesting places to go around here, I think. Very much looking forward to my ride around Acadia later this week! Real nice time at Larz Anderson today! Here's a little video. 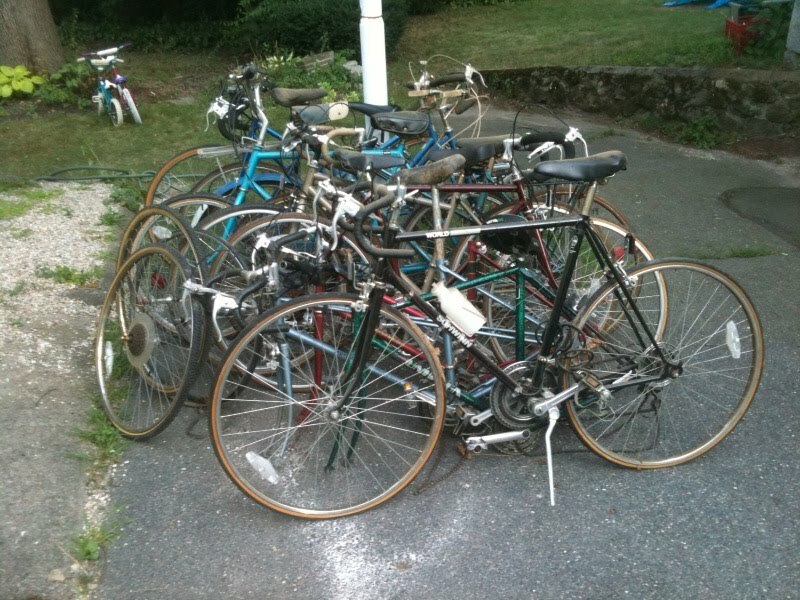 Over the past three years, I accumulated a dozen or so "project" bikes that I hoped to refurb, build up as a fixie, or do something else productive with. Needless to say, I'v had neither the skill nor the time to do anything except watch them collect lots of dust in the space under our porch. So not too long ago, I met a guy who works for Bikes not Bombs who also happens to live around the corner from us. So we arranged to do a pickup today, and he left with a truckfull! Now I've got a lot more space under the porch (neighborhood raccoons rejoice! ), and the bikes are off to good homes somewhere. Christiania much improved after service! Just picked up the Christiania from Landry's on Comm Ave. Initial impressions are very good - they gave it a general once-over, replaced the worn rear tire, and overhauled the hub. Also a new chain and cog to make the hills easier. For $150 all in, it certainly came in much cheaper than i'd expected! One issue seems to have persisted: the noise from the coaster brake. I noticed it almost immediately andcalled the shop. They told me it should go away after a couple days . I hope so - neither the girls nor I could tolerate it! Overall, though, Landry's was great to deal with; everyone in the service dept was really helpful and friendly - which is an unfortunate rarity. When I picked it up, one mechanic piped up wih "that bike has captured the hearts and imaginations of everyone here!" Nice.